Kendall Waston's header deep into injury time gives Costa Rica a 1-1 draw with Honduras in San Jose and a berth at the 2018 World Cup in Russia. 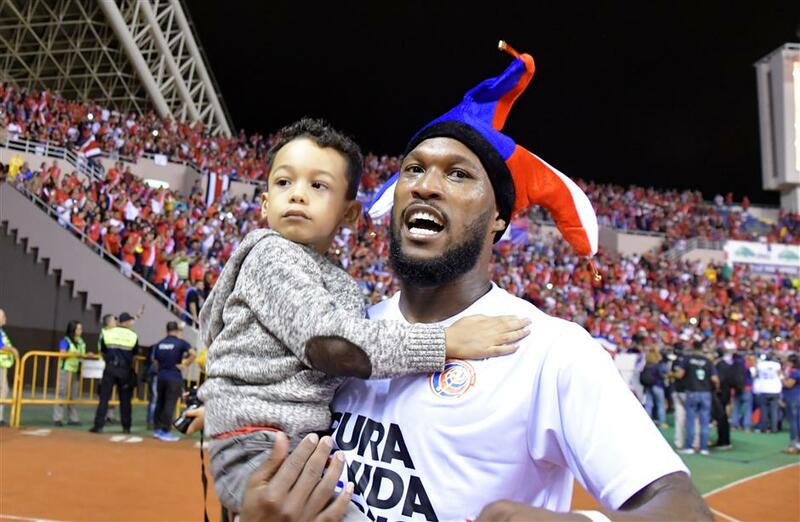 Costa Rica's Kendall Waston celebrates with his son Keysaack after his team qualified for the 2018 World Cup following a 1-1 draw with Honduras in San Jose, Costa Rica, on October 7, 2017. Kendall Waston scored in the 5th minute of second-half stoppage time, giving Costa Rica a 1-1 draw against visiting Honduras on Saturday in San Jose and clinching the Ticos' second straight World Cup berth and fifth overall. The dramatic late goal means the United States likely needs at most a draw at Trinidad and Tobago on Tuesday night to qualify for its eighth straight World Cup. In a match postponed a day because of a tropical storm, Eddie Hernandez's header from Romell Quioto's cross put Honduras ahead in the 66th minute. In the fifth of a minimum six minutes of stoppage time, a long ball from deep in Costa Rica's end following a throw-in was headed from about 23 yards out by Hernandez. Giancarlo Gonzalez headed the ball toward the right flank. Bryan Ruiz flicked the ball ahead to Rodney Wallace who, marked by Bryan Acosta and Emilio Izaguirre, played it back to Ruiz. Ruiz beat Acosta, and Izaguirre before crossing to Waston, who outjumped Maynor Figueroa and Johnny Palacios to head the ball past Donis Escober to the goalkeeper's left from 8 yards. Waston has three international goals, including a header that gave Costa Rica a 1-1 draw in its March qualifier in Honduras. Costa Rica has 16 points and is second in the final round of North and Central American and Caribbean region behind Mexico, which has 21 points and clinched last month. The US is at 12 points following its 4-0 win on Friday over Panama and would qualify with a win at Trinidad on the final night of the hexagonal. Panama and Honduras have 10 points each. Goal difference has become key: the US is plus-five, Panama minus-two and Honduras minus-seven. A draw would be enough for the US to qualify unless Honduras defeats visiting Mexico by at least 12 goals or Panama beats visiting Costa Rica by at least seven or eight goals, the needed margin depending on whether it overcomes its deficit to the US in total goals, currently nine. In addition, the US could qualify with a loss if Panama and Honduras both fail to win on Tuesday. The fourth-place nation advances to a home-and-home playoff next month against Australia or Syria. The Americans would be eliminated only if they lose and Panama and Honduras both win. At the 2014 tournament in Brazil, Costa Rica opened with wins over Uruguay and Italy, then tied England. It beat Greece on penalty kicks to reach the quarterfinals, where it lost to the Netherlands in a shootout.